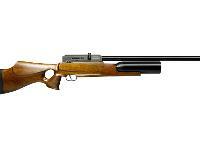 As of January 4, 2013, we will no longer offer the full-auto Evanix Conquest airguns. Only the semiauto version will be offered. Do you hunt? This will be your go-to rifle if you do. Imagine going out to hunt & not having to carry a pump, scuba tank or buddy bottle. 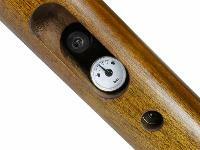 You'll have up to 55 useful shots from the 400cc reservoir. 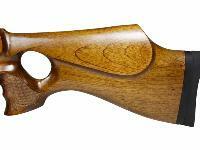 The Evanix Conquest air rifle has a thumbhole stock with checkered pistol grip that has finger grooves for more control. 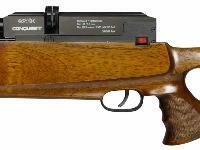 Don't limit this air gun's use to just hunting...shoot spinners, plink and pop some paper targets with it. 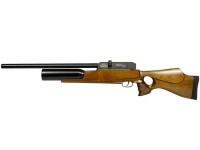 It's an all-round gun that delivers amazing and stunning knockdown power. 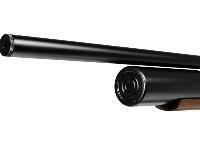 When a Red Ryder just won't do...grab the Evanix Conquest semi-auto air rifle! 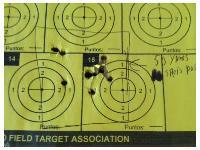 Things I liked: got the .25 cal shot it at 120 yards 5 shot 1 inch group. no wind. 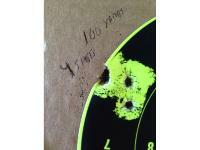 50 yards dime size groups and it will average below one inches but very tight groups. Things I would have changed: i wish the max .25 had shot capacity of 55 use full shot. i just like the bull pup feel. its loud. 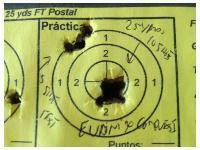 What others should know: 55 use full shot? heres a shot string you decide . prochrono one feet away .200 bar jsb 25 grain 901,901,905,907,909,910,910,907,905,907. 175 bar 910,907,905,903,908,910,903,905,901,898. 155 bar 893,895,897,894,890,893,889,890,880,885. 140 bar err,err, 866,877,873,878,874,872,869,865. 125 bar 869,err,853,853,856,850,842,846,843,841. 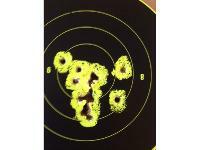 115 bar last five shots 835,832,825,832,822. the first thirty shot is only has 25fps spread!!! the drop is not very sharp and it should be easy to compensate by the 40th shot hold the reticle just a bit over the intended target . 40 to 50 shot is a 37fps spread. the last five shot still have plenty of energy to take down small game at 38 fpe. Things I liked: This is a very well made and powerful weapon. It is consistently accurate. Very good for hunting small game. 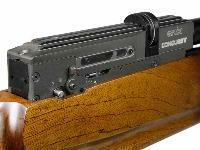 It does require "learning" a new system of power management, pellet loading and controls -- with a rechargeable battery, a power on and off switch, applying the right amount of compressed air and using the spring-loaded magazines. Once you are used to these unique features, the gun handles well in the field. The semi-automatic capability is a real advantage. Things I would have changed: The gun came from Pyramyd with the wrong instruction manual, no batteries, a missing cover panel and no battery charger. It was frustrating, but two deliveries later we were in business and Pyramyd support was very helpful (although only by phone during working hours, my email messages to sales were not returned). It is not a quiet gun and sounds pretty much like a science fiction version of a .22. What others should know: It's not a cheap gun, but the quality is very good. I would recommend the gun to any serious hunter. I think it's pretty expensive for target practice. 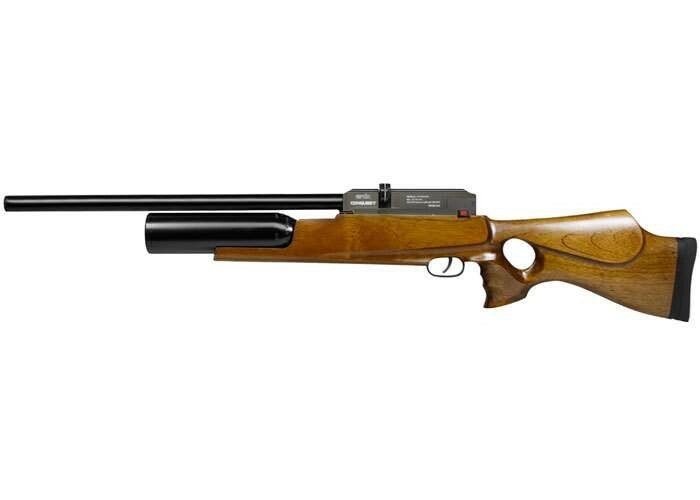 I would recommend using a scope on this gun, but because you will be using the semi-automatic feature I would limit it to 4 x 32 or similar. Things I liked: Quite a nice rifle. I got the .22 model and put on a UTG 3-12x44 Swat IE Scope. 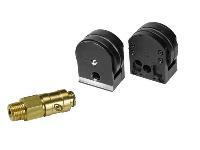 My first tests to align the scope caused one shot to smash the clip on the bullet box and dent the bracket for the target clip. Now that's POWER! Couple shots later and all aligned. 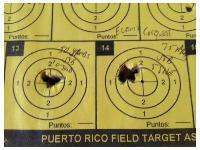 At 15 yards I could easily place groups the size of a quarter. Lots of fun. Too bad the full auto version is no longer available. Things I would have changed: For the price, I think it needs a battery indicator and pressure indicator. Too easy to hit the switch. It should have a safety switch that's hard to turn on and easy to turn off like many power tools. A key switch of some type would also be good for safety. The manual says the gun is damaged if it completely runs out of air - so there should be a pressure sensor shut-off when pressure is low. For over $1500 I would expect a few extra safety features. That's why only 4 stars for value for money. 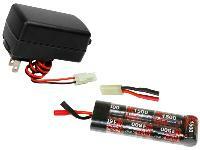 What others should know: Insure you get the correct spare battery. Mine needed a female connector but the suggested accessories sold me the one with a male connector. Pyramid promptly took care of it but said some guns have male connectors. So either call them to be sure you get the right spare batteries or order them after you get your gun. It takes a moment to get used to the electric trigger. One you do, it is nice. No recoil and amazingly quiet. Oh, and EXTREMELY POWERFUL! Be careful what you shoot at. Like using a real .22 rifle with sub sonic ammunition. Is the 22cal version still avail ? As of this moment, only in refurbished. 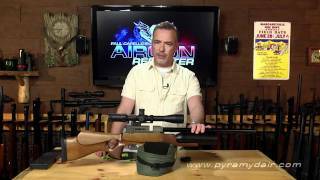 Why do you not sell the full-auto model anymore, pyramidair ? 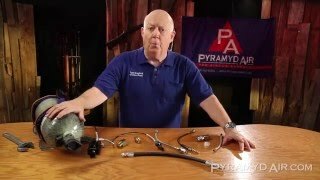 With all off the shooting that have occurred within the last couple of years, Pyramyd has decided to stop selling all full auto airguns. That way we can continue to serve you without facing any scrutiny from the Government. Are extra battery packs available? yes, under the recommended accessories.